With only 3 ingredients, you can baconify one of your favorite candy bars: Reese’s Peanut Butter Cups. 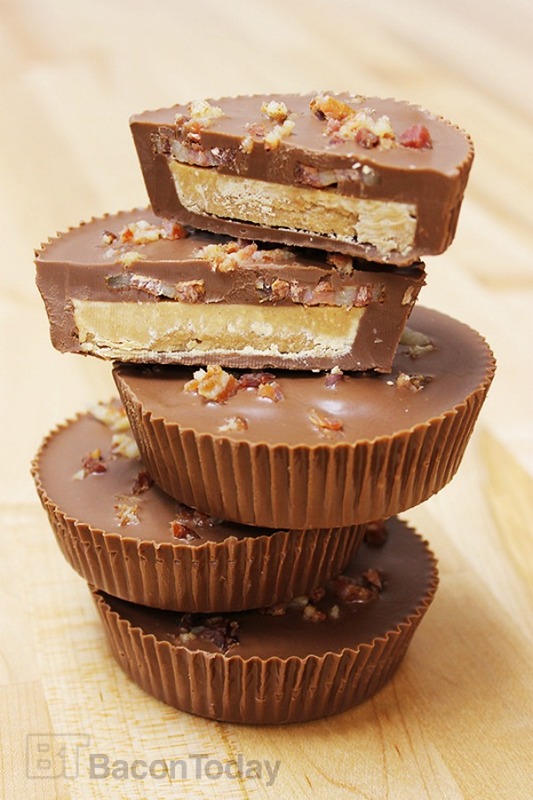 Bacon, chocolate and peanut butter are a triple whammy of addictive, complimentary flavors. We decided that a typical Reese’s Peanut Butter Cup is way too small, so these ginormous cups are as big as the palm of your hand. The interior consists of peanut butter and whole bacon strips so you get a lot of salty, bacony flavor surrounded by a thick shell of sweet milk chocolate. For those of you who prefer those dark chocolate or white chocolate Reese’s, feel free to use whatever chocolate you prefer. Enjoy! 1. Preheat oven to 350° F. Grease a cupcake pan and place 8 peanut butter wafers in each cup. Place in oven for 5 minutes or until wafers are melted. Use a toothpick to spread the peanut butter evenly over the bottom of each slot. Place in refrigerator to chill. 2. While peanut butter is cooling, melt the milk chocolate wafers in a double boiler. When peanut butter discs are cool, carefully remove them from the pan. Arrange the tart liners on a baking sheet or tray. Pour the melted milk chocolate into the tart liners, filling ¼ of the liner. Place the peanut butter discs on the melted chocolate and press down slightly. 3. Cut each strip of bacon so that it will cover the peanut butter. Do not let the bacon touch the edge. Add the rest of the milk chocolate so that it fills the tart liner. 4. Dice the remaining bacon strips finely for bacon bits and sprinkle on top. Place the tray in the refrigerator and chill for 30 minutes and devour.